This is my first release of Alternate Reality X. This is version 0.83.3. I picked this up from Arnic that has been working on this for years to get to this point. It is a great game. I found ARX about 3 years ago and tried it for a bit, but I didn't find it very playable at that time and game back in 2017. I found it in a very playable state but then I found out that we had personal things going on and was unable to complete the game. So I decided to fix some of the bugs and then that evolved in completing what he started. My goals are simple, that is to complete The City. There are many things missing from the City. Like weather, need for wearing Clothing. Spells, curses, poisons and many other items. Once, the city is complete, then I'll look into completing the Dungeon. If bugs are reported, then I will look at fixing them. If the bug is related to unfinished code, then nothing will be completed until the city is completed. You can download the release here. * Fixed - Graphics mode Alternate would cause a crash on start. * Fixed - New Character Immobilized, clothing caused this when inserted into inventory. * Fixed - Hours in certain Inns wrapped over to the next day and you where not able to enter that inn. * Fixed - Player position on automap being off by one. * Added - A timeout option during fight, opponent will not do something instead of waiting forever. If player leaves, it will timeout after 20secs and clear the screen. No more locking up the games in waiting for keyboard inputs. * Added - when you try to flee an encounter there is a chance it doesn't work. * Added - Ghost attach can now be the "Bone-Chilling" attack. Certain percentage. Reduced STR by one if was successful. * Added - 2 new diseases. Mold and fungus from MOLD, slime. Slime will foul your food once it becomes active. These takes 48hrs before they become active. * Added - Sun set and sun rise to 16bit graphics. It is not done by still graphics. Drawn on the screen based on time. that way it moves like a real sun. * Fixed - Ghost information was not correct on armour. He is suppose to be invulnerable to blunt, sharp weapons. you need magical weapons for the most part. Fixed that. * Fixed - put back in the weapon selection for opponent when they attack. 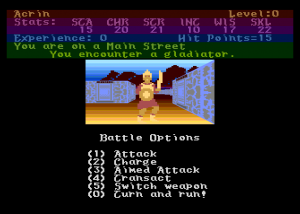 Many opponents have different attacks was hard coded to just the first weapon. * Fixed - Armour ability to handle different weapons is back into the system. If using a blunt weapon and the armour is invulnerable to blunt. You will not be able to do any damages with that kind of weapon. * Fixed - Certain armour is vulnerable to certain weapons, and these weapons cause double damage. * Added - Put these encounters into possible city/dungeon encounters. vs. encounters alignment will increase or decrease your chances for more monsters at once. * Added - Started loading in attributes for weapons. Its loads in weapons that causes curses and dieseases. Not active in the code yet. Have not loaded the weapon attributes values into the system yet. Like, How long it last. 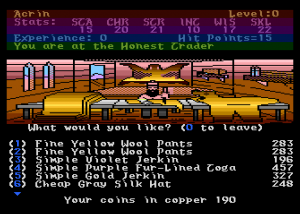 * Adjust- Adjusted the Treasure finding stats. Potion should only be in affect until you find treasure and then it should go away. In the code, the treasure just kept getting higher. Adjust treasure. You got a weapon on almost every encounter. The original game was not like this. It was much hard to get weapons. The chances for finding a weapon is much higher now. * Adjust- Treasure Torch and Keys will not show up in the city anymore. The city didn't have these items. You end up with so many of these items you never have to want for this. * Added - When you find a potion you get 120xp points like the city gave you. * Fixed - Fixed Weapon damage. It was calculating weapon damaged wrong. Way to high. It was doing a bit check for number of dice and number of sides to the dice. This was not correct. a Value of 36 would be 3 dice and 6 sides. bit check would turn this into a different value. * Charm,Trick, Attack - on certain good characters causes your alignment to decrease. good, then each act causes it to go down a bit. At the time of writing (Sept 2018) of Alternate Reality X is under development, this status is based on the Java Edition. The list below is provided to give an indication of the features that are still to be fully completed or added to ARX. The list below can be searched and sorted by column so you can home in on the areas that interest you. I’ve also tried to indicate statuses of tasks. Let me know if you think any items are missing. These will be available in 2018. Cookies are required to enable core site functionality. ©2019 by ARX.